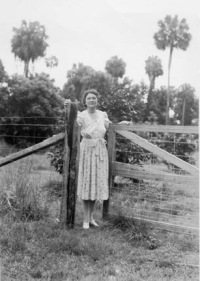 On August 8, 1896, one of Florida’s greatest novelists and conservationists was born: Marjorie Kinnan Rawlings. Although she grew up in Washington D.C., Rawlings settled in rural Florida, writing about the land and people of her surroundings. Her works included the Pulitzer Prize-winning The Yearling, and Cross Creek, an autobiographical account of life in her beloved Florida — she loved her hammocks. Happy birthday, Marjorie! A warm, long-overdue hullllo and peek-a-boo from the depths of South Florida, to the blogging world — I’ve missed you all so! 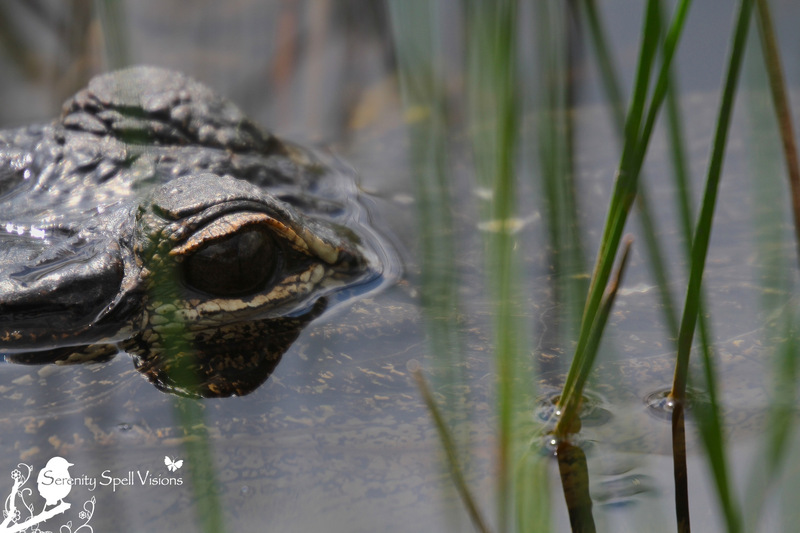 Nearly stumbling about this sweet juvenile gator in Grassy Waters Preserve. Hullo, fella! ← Hit the Trails — It’s National Trails Day! A “sweet” gator? Just don’t put your hand in the water! 🙂 I do love your photography though and your tribute to Marjorie Rawlings. Thanks for sharing. Heh, I just adore our gators… Most of the year (non-breeding and non-baby times), they really are the most mellow creatures. Powerhouses, of course — but mellow. …. Glad to see you back, M’lady! 🙂 Thanks so much! Hopefully I’ll be a bit consistent, too…. You’re so sweet — THANK you!! 🙂 XO! Fabulous quote, and love the story and pictures. Don’t know Marjorie Rawlings before, but I should I see, and now I know a little. I’m glad you’re back with your great blog! I missed you. Marjorie Kinnan Rawling’s novel is known to me and I saw the film with Gregory Peck. I cried so much! Aw, thanks so much — you’re incredibly kind! I’ve really missed the space and people (although I’ve tried to keep up a bit)…. Do you know, I still haven’t seen the film — for that very reason, I know I’d be a bawling wreck?! Aw, you’re so sweet — thank you!! I can’t believe it’s been so long, sheesh! I can’t believe how quickly time passes… It’s amazing. I’ve missed everyone terribly, though. May I reblog this on my site? Absolutely, please reblog away!! It really is a beautiful message… XO! Hi FeyGirl – you’re welcome and I’m sorry it’s been awhile.Thank you, I did reblog this on my site at http://plaintalkandordinarywisdom.com/reblogged-peek-a-boo-i-see-you-by-feygirl-at-serenity-spell/. Also, I just wanted to let you know I nominated you for the “Peace and Justice Award” at http://plaintalkandordinarywisdom.com/oh-boy-got-more-awards-for-which-to-give-thanks-and-share/. Hope you’ll consider it and accept it. Thank You! Aw, thanks so very much for the reblog… AND for the sweet award nomination! I had never heard of this one; such a lovely one at that. CONGRATS to you on your awards, too! I’m very sorry, too, for my tardy reply — I’m slowly trying to return to the blogging world, baby steps with my replies. I do miss it! Hope you’re doing well!! You’re welcome, FeyGirl. No problems in getting back to me. I’m just happy to share you with my readers. Love the gator eye. He’s glad to be published. Thanks so much! I love your perspective, heh… You’re right though, this little guy was SUCH an accommodating model. Didn’t move the entire time I was snapping away. 🙂 He knew he’d be loved by all! I´m so glad that you are back again, i really missed your posts ! I always learn something from you , this time about Marjorie Rawlings . Lovely tribute you gave her with this post ! Thanks so very much Maria!! It’s been far too long since I’ve been away, but I hope to change that VERY SOON. I miss it terribly!! I can’t believe it’s taken me this long to even look at the comments, sigh. No worries, though. I have plenty of images waiting — I can’t stay away from this beauty for too long at a time! You may have been absent for a bit – but your spirit has prevailed. Wonderful quote. For anyone who is near north-central Florida, visit Marjorie Rawlings homestead and museum. It’s a wonderful area! Careful – you may never leave! Thanks so VERY much for that! It’s been tough not being able to get out (quite) as much as I’m accustomed to, but that’s slowly changing. I hope to begin posting (somewhat) regularly soon enough, as well. I miss it terribly. Thanks so much!! I’m so sorry that I’ve been out of the loop…. And incredibly tardy on my responses! Hah! 🙂 XO! What a delight to find you here again, and not only that, posting about Marjorie Kinnan Rawlings. (Do folks in Florida and folks in the know use all three names to refer to her? It sounds as though we should – like George Washington Carver.) I still remember our discussions about hammocks, back when I learned they’re not something you take a nap in! I just thought of you last night, when I read a post about galinippers showing up in Alabama. I hope they’re not giving you the kind of fits I’ve read about in the paper. Aw, you’re so incredibly kind! I miss this space terribly, and vow to return VERY SOON. 🙂 Heh…. Hammocks! I’ll be visiting ours now that our weather is…errr…dipping a degree or two?! Oh my. Oh MY. I actually had to look up that beast — I had never even heard about it! And for once, I’m glad I’m so incredibly tardy on these responses, because I would have been panicking on the few hikes I DID manage this summer! Hah! Hello Feygirl, good to see you back after your summer recess. I’ve been doing the same, collecting photographs for lots of posts and now I’m catching up with all my esteemed fellow bloggers. Marvellous quote. Very wise words indeed. I think every politician should have these words embazoned on their consciousness! I love your baby gator too. Do you ever stumble across Mum or Dad? And if so is it ever potentially dangerous. Thanks so very much! And ditto…. I miss this space, and the incredible amount of talent and knowledge that the community holds. I’m always astounded by it. Ah, that sweet gator! He was actually more an adolescent, so he was already on his own. No mama or papa around. 🙂 But yes, if there are baby gators, one has to be VERY careful to look for mama — and she’s sometimes hiding VERY WELL — because she’s very protective, understandably, of her little ones. But still, I shocked myself silly nearly stepping on this guy — especially since it was a solitary hike of mine! At least he was kind enough to stay and pose for me the entire time, eh? 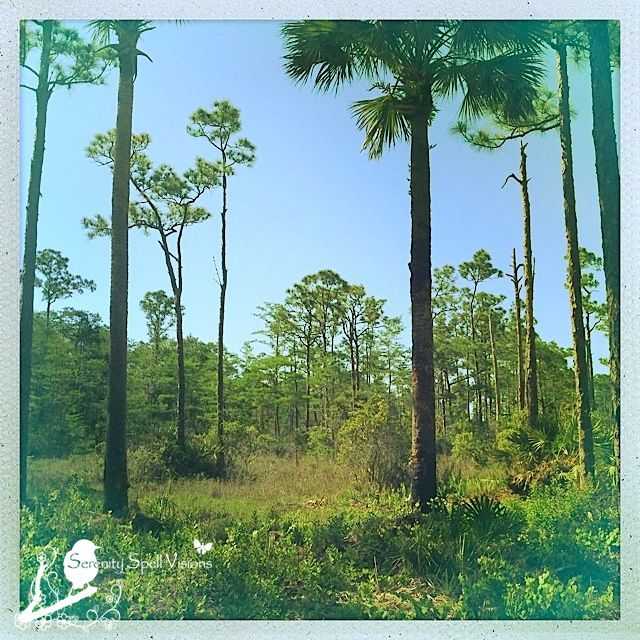 I think the Cypress Creek Natural Area would be a place easy to love! Good to see you out and about again! So glad to see you back from the demands of your workload!! Work is good though these days!! And such a lovely tie in with Rawlings birthday…thanks for that bit of history and the eye of the gator to remind us who minds the swamp!! Hee…. Well, my return seems to have been short-lived. 🙂 Look how long it’s taken me to respond — and with no other post, sigh! I adore this guy. I quite nearly stepped on him on a solitary hike out in the ‘glades in June or July… Didn’t even see him! They’re so amazing with that camouflage. I saw the movie version of Cross Creek a few years ago. You may want to watch it if you haven’t already. You know, shockingly…. I’ve yet to see it! Appalling, I know. I’m glad you’re back! Nice pics. And Marjorie sounds like an amazing woman. Ah, thanks so very much! I’ve been remiss with my poor blog, between work and the heat… But I truly hope to return, and VERY SOON!!!! 🙂 I hope you’re doing well as we enter fall (hoorah!)…. I hope you’ll read and enjoy this short “Peek-a-Boo, I See You!” post by Feygirl at “Serenity Spell”. Her quote from Marjorie Kinnan Rawlings, Pulitzer prize-winning novelist and conservationist, was especially meaningful to me. Hi FeyGirl – thank you for permitting me to reblog your post on my site. You can see it here at http://plaintalkandordinarywisdom.com/reblogged-peek-a-boo-i-see-you-by-feygirl-at-serenity-spell/. Right back at ya…. I never knew she wrote the Yearling… thanks for the pics. Love the ali. Thanks so much! A truly amazing woman…. Now you have to confess who you have been swimming with!!! Thank you for the eye!! Aw, I’m trying, I’m trying! See, baby steps… I’m replying to comments, hoorah! Next step: A POST! 🙂 I hope you’ve been well. XO!! Yes, I have and I am glad to see you more often. Hope you are well. I understand that sometimes life gets a bit much and the desire to communicate is pretty small. If you need an ear my e-mail address is mpolding@gmail.com and my skype is mari19505. Take care and as you can see up here in Toronto, we are in a deep freeze – not exactly global warming weather, that is for sure! Well, I’m not exactly in the deep freeze of your wild north (I honestly don’t KNOW how y’all handle that kind of cold!) — but I’m in Atlanta now for a visit, and we’re in a State of Emergency. Three inches shut the city down; people have been stuck in their cars for 20 hours; and the roads remain impassable due to ice. Those poor souls, though — it’s still in the single digits out there. Thanks – maybe you will find a call from me one day. Up here we go by Celsius and even in single digits in Atlanta are pretty cold in Celsius – eg. say 9 Fahrenheit , this is double minus 30 making it -12C which actually is not so bad but when you figure in the windchill factor the temperature can feel like -25 or even -30C which would make it approximately zero Fahrenheit because 32F = 0 degrees Celsius. Today for example we were -15C but it felt like -25C but tomorrow it will be a blistering -2C with snow starting some time tonight as the temperature rises. Snow does not usually fall if it is very cold but from about -12C to 0 degreesC it can fall for quite a nu,ber of hours depending on the system running through the area. Snow is great stuff – very beautiful when falling and when first it lands where no human life mucks about. To be honest the cold of this year is the first I have seen in my lifetime – especially the length of the cold. Some here are already tired of it but in the end what can you do , so you just add on another pair longjohns, another sweater and move on. Life is grand and can imagine how one could appreciate the warmth of spring and summer after a winter like this??? – That is until it is too hot to bear and then the complaining sets in again, only this time about the heat That’s life in the “wild north” , I want to say!!! Hahahh! SO true, so true. 🙂 I just can’t imagine that kind of cold though, but I’ve never lived in it… NEVER! I’ve been in cold, but not like that. I’m in awe over people who do. And I LOVE the sound — or lack thereof — of snow as it falls. It’s incredibly peaceful. But you’re right, afterwards? So tough. As evidenced in Atlanta’s recent shutdown (still partly in effect — I barely got out, yesterday!). would like to stop, but we are always in a hurry to get to our appointment. Ah, thanks so very much for your comment…. And how wonderful! I can imagine it would be difficult to plan a visit on the way to a hospital, but how wonderful a stop would be…!? It’s been *far* too long, I know!!! Between work and the heat, I haven’t been able to have fun with my poor blog, but I hope to resolve that soon… 🙂 It’s so wonderful to see you, though!! Loved the (very true) quote and the photo of that gator winking at us! Ah, I’ve missed this poor blog terribly! I wish I could have done more hiking down here this summer, but I did have the excuse of the heat (right?). Such a lovely post of such a special lady. Would you believe that I have an original copy of her cookbook? It’s great seeing your little cute face now and again, and hope all is going well with you. Heee… Lookie! I’m starting to respond to my comments! Uhhh. From October. I’m so so sorry! You have an ORIGINAL copy of a cookbook of hers? WHAT? I’m a nut about antique books, original copies, and the like. What a coupe! Oh..I mean original first edition. I’m silly..How are you? be so glad you’re not in the snow. Oh, I’m sure that’s what I was referring to, an original first ed! 🙂 Hee… My brother was SO excited yesterday; he called to tell me, “the sun’s out, the sun’s out — let it melt!” The last two times I was up there (recently), we got more than a foot each time. I was calling myself the Ice Queen for bringing it with me…. So good to see you again! I’ve been away for the last few months and have only slowly made my way back to blogging. Thank you for stirring quote and for introducing me to Marjorie Kinnan. I’ve just been reading up about her and thought you might like this one as much as I do. And, double-hee… I’m obviously quite behind with my poor little blog as well! So I apologize for this long-overdue reply. But replying is the first baby-step towards a new post, yes? I miss it so. Greetings!! I’m so very sorry for the tardy reply… But thanks so much!! It’s greatly appreciated. And CONGRATS to you on your award! Thanks so much again for this nomination — and happy (late) 2014, wink! Another CONGRATS to you on your award! Thank you for all your kindness throughout the past year. You’re so very welcome… And thank you for providing such an uplifting and inspiring blog for us all! I apologize for the tardy reply; but I’m trying to finally catch up! 🙂 Blessings to you in 2014!! I loved that Marjorie Rawling quote. So, what is it we need to do to retain that consciousness of the environment around us, as we repeatedly get buffeted by life’s tribulations? Isn’t that quote a wonderful reminder? For me, I constantly escape to nature herself to remember…retain…that consciousness. It doesn’t take much, even digging in the soil, or looking up at the sky, if a hike is too far or too difficult. We’re surrounded by such beauty — but it’s easy to forget when overwhelmed with the day-to-day tribulations. Wow, look at that eye! Lovely quote and so true. It’s so wet here I could almost imagine one of your gators coming out of the swamp in our field! I love your blog; it’s incredibly beautiful and inspirational.